The Cheltenham Town defender Michael Wylde signed for the Harriers in March 2008 on loan until the end of the season. Wylde was previously with the Harriers as a youth player but joined Town three years ago. He has played less than ten games for them because of injuries. 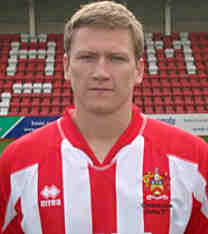 On his return to Whaddon Road he was released and joined Tamworth. He stayed there for three seasons before leaving to join Cambridge Utd.